Heat oven to 350°F. Spray 13x9-inch (3-quart) glass baking dish with cooking spray. Cook and drain pasta shells as directed on box. In 4-quart saucepan, melt 1/4 cup butter over medium heat. With whisk, stir in flour until smooth. Cook and stir 1 to 2 minutes or until mixture is smooth and bubbly. In 4-cup glass measuring cup, mix broth and whipping cream. Gradually stir broth mixture into saucepan. Increase heat to medium-high; heat to boiling, stirring constantly. Boil and stir 1 minute; reduce heat to medium. Add cream cheese and cook until melted, beating occasionally. Remove from heat. Stir dressing mix into sauce mixture. Pour 1 cup of the sauce into bottom of baking dish, spreading to cover. In medium bowl, mix 1 cup of the sauce, the chicken, spinach, 1 cup of the shredded cheese and 1/4 cup of the green onions. Fill each pasta shell with a heaping tablespoonful chicken mixture; place in baking dish. Pour remaining sauce on top of shells. Cover; bake 35 to 40 minutes or until heated through. Sprinkle with remaining 1/2 cup shredded cheese; bake uncovered about 5 minutes or until cheese is melted. Meanwhile, in 8-inch skillet, heat 1 tablespoon butter over medium heat. Add bread crumbs; stir to coat. Cook and stir 2 to 4 minutes or until golden brown. 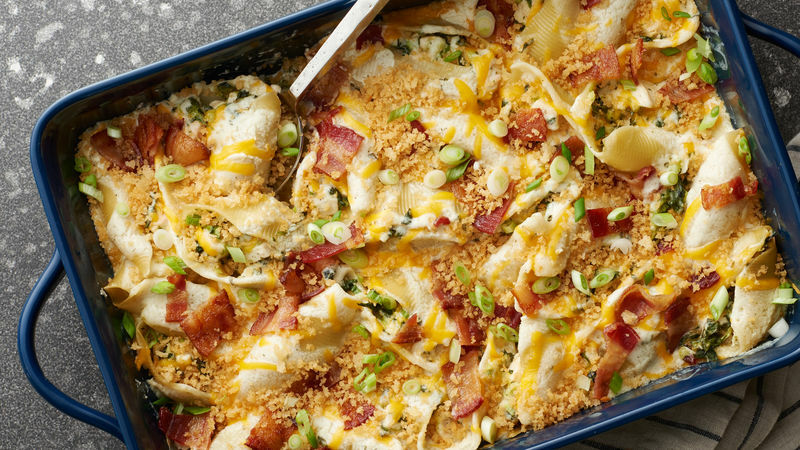 Before serving, top shells with bacon, bread crumbs and remaining 1/4 cup green onions. Covering with foil during baking helps keep pasta shells from crisping. Shredded Colby-Monterey Jack cheese blend is a great substitute for Cheddar in this recipe.